OTTAWA - Blue Bombers linebacker Jovan Santos-Knox recovered a fumble in overtime as the Winnipeg Blue Bombers avoided a disastrous loss to the Ottawa Redblacks. After the Redblacks came from 15 points down in the final five minutes to force overtime Friday night, Bombers quarterback Matt Nichols completed a touchdown pass to Weston Dressler, then made a two-point conversion before Santos-Knox's a fumble recovery to escape Ottawa with a 40-32 win. "It's been said a number of times, a big-time player making a big time play when his teammates need it the most. He did just that,'' Bombers coach Mike O'Shea said of Santos Knox. Sinopoli took full responsibility for the fumble and the loss after the game. On a positive note for the Redblacks, Lewis Ward kicked three field goals to set the CFL record for consecutive field goals made. Ward tied Rene Paredes's record of 39 made kicks, set over the 2012-13 season with the Calgary Stampeders, at 11:41 of the third quarter with a 42-yard boot. After Winnipeg fumbled on the next possession, Ward quickly tied the record with a 40-yard field goal at 14:17, cutting the Bombers lead to 22-17. "It's pretty special,'' Ward said following the game in a sombre Redblacks locker-room. Nichols completed 27-of-36 passes for 265 yards and three touchdowns, including a 12-yard strike in overtime. 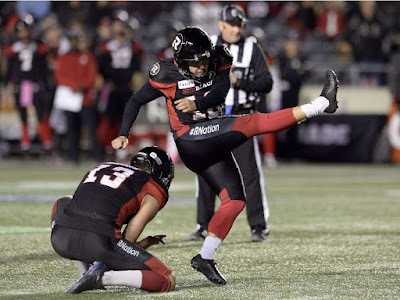 After Nichols connected on a 12-yard TD pass to Dressler and Justin Medlock had a 27-yard field goal to take a 32-17 lead with just over 11 minutes gone in the fourth quarter, the Redblacks went to work. "It was two or three different games throughout the course of the evening,'' Nichols said. The loss cost the Redblacks (8-7) a chance to clinch a playoff spot and a post-season home game. The Bombers (8-7), meanwhile, gave themselves a bit of breathing room in their playoff push in the very tight West Division.